The Pack Installer is a utility for installing, updating, and removing software packs, and can be launched from within µVision or standalone. The menu Project - Manage - Pack Installer... starts the Pack Installer. Installs, updates, or removes software packs and thus, software components. Refer to Importing Custom Software Packs, which also explains how software components relate to software packs. Lists installed software packs and checks for updates on the Internet. A brief release history might be displayed before updating a Software Pack. Lists example projects available from installed software packs. Offers filters to narrow the list of software packs or example projects. Displays the progress of the executed function in the status bar at the bottom of the window. Refresh Refresh the information in this window. Use this menu to reload context menu information. Messages are displayed in the Output area. Import Launch the file browser to select .pack or .zip files that contain software components. The files can be located on your computer or on a mapped network drive. Refer to Importing Custom Software Packs. Messages are displayed in the Output area. Import from Folder... Launch the file browser to select a folder that can contain one or more extracted software packs. These packs will be copied to the pack folder defined in the TOOLS.ini file. Manage Local Repositories... Launch the file browser to select a folder that contains an extracted software pack. Refer to Using Local Repositories for more information. Check For Updates Checks the Internet for updated and new software packs and example projects. The result is displayed in the Packs and Examples tab. Check For Updates on Launch Checks the Internet for updates every time Pack Installer is started. The left side of the Pack Installer lists devices grouped by vendor and device. The right side lists software packs and example projects that can be used with the device or board you have selected. The picture shows software packs available for the selected Cortex-M4 device. 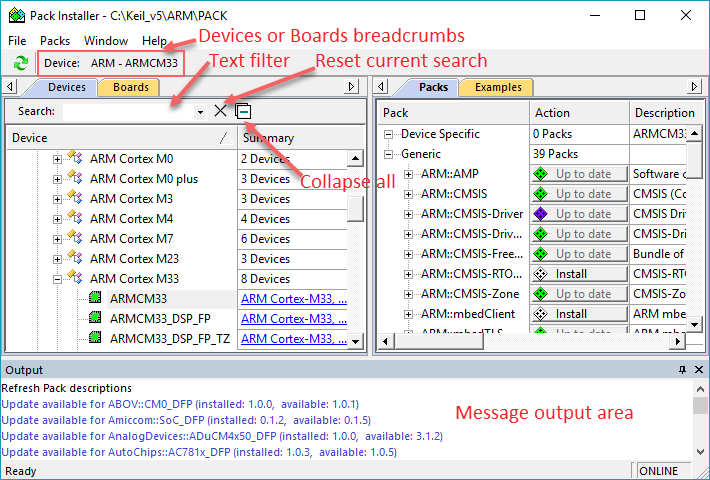 The device-specific software pack Keil::ARMCortex_DFP must be installed. The generic Software Pack ARM::CMSIS is up to date. Multiple versions of this software pack are available on the workstation and can be used in projects. Version 4.1.9 has been downloaded onto the workstation. Software components from this version are not available for projects until unpacked. Messages about performing actions are displayed in the Output area. Select a device or board to narrow the list of software packs or Example projects. Device-specific software packs are displayed on the top of the list. Software components from generic software packs can be used with any device. Enter a Regular Expression to narrow the list within the filter area. Resets the filter for the dialog Devices or Boards. Resetting the filter for one dialog does not affect the other dialog. For example, resetting the filter for Devices keeps the Boards filter unchanged. Lists devices grouped by the manufacturer or board. Click on an entry to narrow the list of software packs or example projects. Provides information about the device group. For devices, the field can provide a link to the Internet with additional information about the device, for example, to the Keil web page www.keil.com/dd2/vendor/device. Displays messages about executed actions. Messages have different colors. The context menu allows you to clear the window. You have functions to copy a selection of messages or to select the entire content of the Output area.